Well, here it is, the end of October and finally time for a RAMPAGE TOYS update! In recent news: Japan is awesome!!! 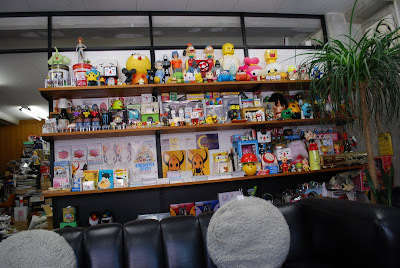 Not only is Japan awesome, beautiful and home to some cool and crazy people and places, but it's basically the capital of AWESOME toys and toy designers! In fact, I'd go so far as to say that Japan is the capital of design in general - what with kids and designers pumping out the cutting edge in style and other such craziness, and flaunting new fangled (and old-school) styles in a way few Americans (or even Euros) would feel confident doing. Need I repeat the word: AWESOME!!!! Much anticipated in my travels was a quick visit to one of the ALL TIME BEST toy and graphic designing collaboratives in the world: DEVIL ROBOTS! These guys are amazing! They manage a balance between the standard (and requisite) Japanese Kawaii (= cute) and cool and edgy designs. They merge these two elements wonderfully and have come up with some of the most enduring and FUN characters in modern toy and graphic design - to name a couple: DeviRob (a gangly and mysterious guy who wears a helmet with BIG RED horns) and Tofu Oyako (the marvelous little cube-headed figure loved world-wide by kids, adults and all ages in between). 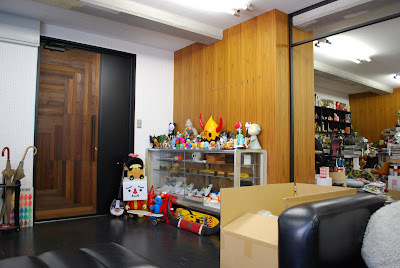 Here are a couple of shots of the Devilrobots studio - LOOK AT ALL THOSE TOYS!!!! Above: Devirob in the top middle on the table, and Tofu Oyako bottom left in the red one-zee! The DR head-cheese (Shinichiro), and his second in command, were incredibly welcoming and even threw some free schwag our way. How awesome is that! Check out Devilrobots on Facebook or take a gander at their website (http://www.dvrb.jp/w/) - though Japanaese proficiency might help on that end of things - not much English on the site. I would also highly recommend visiting these guys if you are EVER in Tokyo! Anyway, what would a RAMPAGE blog posting be without some RAMPAGE artwork!?!?!? So, here it is, inspired by Hyo Myazaki (possibly the most talented person in animation - "creator of Spirited away" an "My Neighbor Totoro") - my take on the Makuro Kuroske - those Cute little dust creatures that live in your attic and keep evil spirits at bay. Everyone can use a little extra good luck hanging around! These guys are made of felt and yarn - oh so soft and cuddly.